Irma Resendez | Author, Activist, Founder of Familia Unida Living with Ms.
Start your year with Simply Amor! Yes, it is that easy… Begin your “new you” with the most love in your heart than ever in your life! Before you know it, you will smile more, laugh more and even be sillier. Yes being silly is okay. In fact, many of us are so busy being strong leaders and believe that we are supposed to have strong hearts of steel that will keep out the bad and ugly negative vibes that are sometimes in our thoughts and in our space. Be careful, pay attention to your words and your actions. Create your space that will result in saying healing words and more positive attitudes and remember to have fun! Why? Because when we have fun and can laugh at even our mistakes and wrong choices is when we can begin to forgive ourselves for not being perfect. You deserve to shine and let more goodness enter your life. Well, I say, let that strong heart be soft and open to trust and love without limits! Accept you as you are right now. Yes, say out loud right now “I am gorgeous right NOW.” Please don’t wait until when you have enough money, lost those extra pounds that are a leftover from Thanksgiving or when you have a job or a better one. Remember that your positive attitude will attract more greatness! So how do we really get there? Seriously, it’s simple. “Simply Amor” is about forgiving yourself for all your faults, letting go of that bolsa de coraje (bag of anger) and replacing it with a bolsa de amor that is at your side and inside you that travels with you wherever you go. 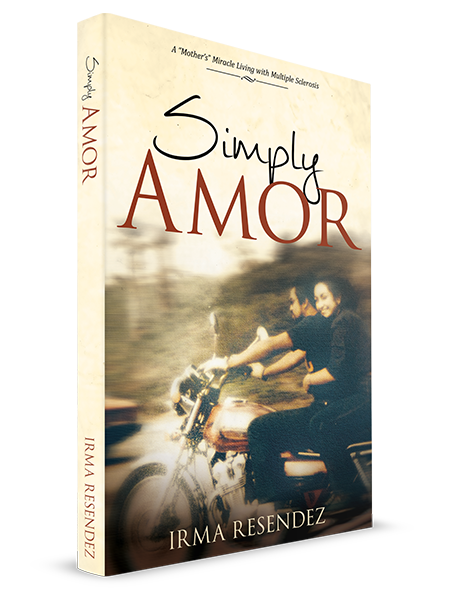 So if you are wondering, how did Irma come to “Simply Amor”? Okay, it took me a while to get to this belief, but now that I am here. I want everyone to embrace it because when you know something good works, it’s great to share it and witness the transformation that transpires when we are feeling incredible. In 1990, I was 28 and my daughters were 3 and 4, I was diagnosed with multiple sclerosis and had to use a wheelchair and was told by my neurologist that I would probably never walk again. Today, there is no cure for MS, a neurological disorder that affects your central nervous system. Some individuals living with MS are known to experience major depression, speech disorder, visual loss, paralysis and a combination of other symptoms that you can learn about by your doctor or online as a reference. I share this insight with you. Author & Motivational Speaker Irma Resendez earned her Bachelors and Masters in Social Work degrees from California State University Long Beach while also creating Familia Unida Living with Multiple Sclerosis that is recognized as the first Multiple Sclerosis nonprofit in the United States to outreach to the Spanish speaking MS community in the early 1990's. Today, Irma continues to serve as the Chief Executive Officer. Familia Unida has evolved to serve over 15,000 diverse communities living with MS and various disabilities in Southern California. Irma is contacted from all over the world thanks to the internet connection that bridges partnerships and new friends. Irma is an internationally acclaimed advocate and sought out inspirational speaker on topics related to maximizing your quality of life, community building, philanthropy , healthcare, disability awareness, culturally diversity are some of the most notable. She has served as a Disability Commissioner for the County of Los Angeles, featured in English/Spanish mainstream media outlets for her commitment to serving her community. Irma has received numerous awards and recognition's from the government, foundations and community for her tireless efforts of exemplifying the importance of love and unity. Copyrights © 2014 All Rights Reserved by Irma Resendez.